On a sunny day many years ago, in a crowded Barnes and Noble in Hilton Head, South Carolina, I met a woman who was destined to become one my best friends. Fueled by caffeinated beverages, Cindy and I chatted for hours, squealing each time we discovered shared interests (writing, travel, ghosts, 80s music, and photography) and coincidences (we had eerily similar childhoods and had the same big, blond beach hair in our 20s). One of the things I remember most about our first meeting was Cindy's unbridled enthusiasm for Scotland. As I shared stories about my travels in la belle France, Cindy shared stories about her journeys to Scotland. 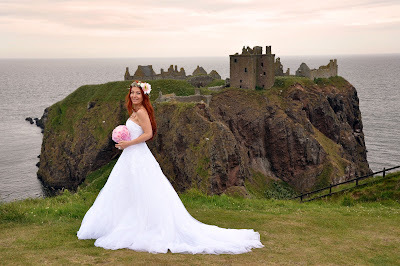 One place in particular that truly captured her imagination (and eventually mine) was Dunnottar Castle. The ancient, clifftop castle located on the eastern coast of Scotland was, in fact, the setting of her first novel, Spirited Away. As the years passed, Cindy and I became the closest of friends. We also became travel partners who enthusiastically took memorable and outrageous trips. This past summer, Cindy took me to her favorite place in the world: Dunnottar Castle. After years of listening to her describe the craggy cliffs and crumbling stones, I was anxious to experience the essence of her hallowed place. Though, I must confess, after spending two weeks hiking through Scotland's golden gorse-covered hills and around her beautiful but decrepit monuments, I was a little numb. It would take a lot to wow me. My senses were overwhelmed, my extremities were freezing (50 degrees in July, seriously? ), and it was raining (again)! After rounding a narrow bend, Dunnottar loomed ahead of us, precariously perched on a cliff, surrounded by the sea. It took my breath away. We parked in a little lot and made the lonely trek to castle. I was cold and wet but invigorated by my first view of my best friend's dream castle. As we trudged along in contented silence, I wondered if the fortification would live up to my expectations. After all, Cindy was an extremely talented writer who had woven a thrilling tale of romance set in Dunnottar. 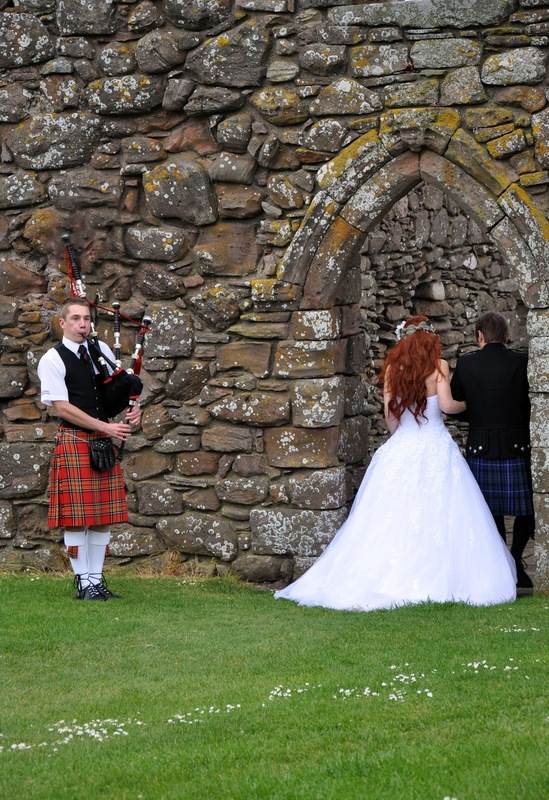 We were almost to the entrance when we heard the haunting wail of a bagpipe. And then, right before our eyes, a beautiful bride in a fluttery white gown, her red hair spilling down her back, materialized as if out of...Thin Air. How odd. 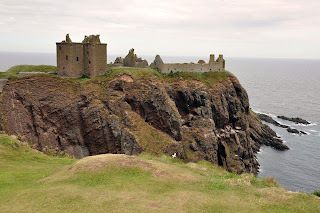 I grew up near Dunnottar and used to go there all the time as a little girl to run around the ruins. I haven't thought about it for years!